CD11c, also known as Integrin, alpha X (complement component 3 receptor 4 subunit) (ITGAX), is a gene that encodes for CD11c . CD11c is an integrin alpha X chain protein. Integrins are heterodimeric integral membrane proteins composed of an alpha chain and a beta chain. 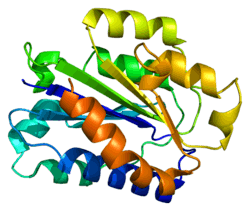 This protein combines with the beta 2 chain (ITGB2) to form a leukocyte-specific integrin referred to as inactivated-C3b (iC3b) receptor 4 (CR4). The alpha X beta 2 complex seems to overlap the properties of the alpha M beta 2 integrin in the adherence of neutrophils and monocytes to stimulated endothelium cells, and in the phagocytosis of complement coated particles. CD11c is a type I transmembrane protein found at high levels on most human dendritic cells, but also on monocytes, macrophages, neutrophils, and some B cells that induces cellular activation and helps trigger neutrophil respiratory burst; expressed in hairy cell leukemias, acute nonlymphocytic leukemias, and some B-cell chronic lymphocytic leukemias. 1 2 "Entrez Gene: ITGAX integrin, alpha X (complement component 3 receptor 4 subunit)". ↑ "Antigen profiles for the quantitative assessment of eosinophils in mouse tissues by flow cytometry". Stewart M, Thiel M, Hogg N (1996). "Leukocyte integrins.". Curr. Opin. Cell Biol. 7 (5): 690–6. doi:10.1016/0955-0674(95)80111-1. PMID 8573344. Steinman RM, Pack M, Inaba K (1997). "Dendritic cells in the T-cell areas of lymphoid organs.". Immunol. Rev. 156 (1): 25–37. doi:10.1111/j.1600-065X.1997.tb00956.x. PMID 9176697. Córbi AL, Lopéz-Rodríguez C (1997). "CD11c integrin gene promoter activity during myeloid differentiation.". Leuk. Lymphoma. 25 (5-6): 415–25. doi:10.3109/10428199709039028. PMID 9250811. Ugarova TP, Yakubenko VP (2001). "Recognition of fibrinogen by leukocyte integrins.". Ann. N. Y. Acad. Sci. 936 (1): 368–85. doi:10.1111/j.1749-6632.2001.tb03523.x. PMID 11460493. Valentin A, Lundin K, Patarroyo M, Asjö B (1990). "The leukocyte adhesion glycoprotein CD18 participates in HIV-1-induced syncytia formation in monocytoid and T cells.". J. Immunol. 144 (3): 934–7. PMID 1967280. Gaidano G, Bergui L, Schena M, et al. (1990). "Integrin distribution and cytoskeleton organization in normal and malignant monocytes.". Leukemia. 4 (10): 682–7. PMID 1976870. Corbi AL, Garcia-Aguilar J, Springer TA (1990). "Genomic structure of an integrin alpha subunit, the leukocyte p150,95 molecule.". J. Biol. Chem. 265 (5): 2782–8. PMID 2303426. Corbi AL, Larson RS, Kishimoto TK, et al. (1988). "Chromosomal location of the genes encoding the leukocyte adhesion receptors LFA-1, Mac-1 and p150,95. Identification of a gene cluster involved in cell adhesion.". J. Exp. Med. 167 (5): 1597–607. doi:10.1084/jem.167.5.1597. PMC 2188934 . PMID 3284962. Corbi AL, Miller LJ, O'Connor K, et al. (1988). "cDNA cloning and complete primary structure of the alpha subunit of a leukocyte adhesion glycoprotein, p150,95.". EMBO J. 6 (13): 4023–8. PMC 553883 . PMID 3327687. Miller LJ, Wiebe M, Springer TA (1987). "Purification and alpha subunit N-terminal sequences of human Mac-1 and p150,95 leukocyte adhesion proteins.". J. Immunol. 138 (8): 2381–3. PMID 3549901. Bilsland CA, Diamond MS, Springer TA (1994). "The leukocyte integrin p150,95 (CD11c/CD18) as a receptor for iC3b. Activation by a heterologous beta subunit and localization of a ligand recognition site to the I domain.". J. Immunol. 152 (9): 4582–9. PMID 7512600. Lecoanet-Henchoz S, Gauchat JF, Aubry JP, et al. (1995). "CD23 regulates monocyte activation through a novel interaction with the adhesion molecules CD11b-CD18 and CD11c-CD18.". Immunity. 3 (1): 119–25. doi:10.1016/1074-7613(95)90164-7. PMID 7621072. Garcìa-Barcina M, Winnock M, Bidaurrazaga I, et al. (1994). "Detection of cell-adhesion molecules on human liver-associated lymphocytes.". Immunology. 82 (1): 95–8. PMC 1414860 . PMID 8045597. Philippeaux MM, Vesin C, Tacchini-Cottier F, Piguet PF (1996). "Activated human platelets express beta2 integrin.". Eur. J. Haematol. 56 (3): 130–7. doi:10.1111/j.1600-0609.1996.tb01331.x. PMID 8598231.
de Vree WJ, Fontijne-Dorsman AN, Koster JF, Sluiter W (1996). "Photodynamic treatment of human endothelial cells promotes the adherence of neutrophils in vitro.". Br. J. Cancer. 73 (11): 1335–40. doi:10.1038/bjc.1996.255. PMC 2074486 . PMID 8645576. Bernstein CN, Sargent M, Gallatin WM (1998). "Beta2 integrin/ICAM expression in Crohn's disease.". Clin. Immunol. Immunopathol. 86 (2): 147–60. doi:10.1006/clin.1997.4462. PMID 9473377. Shelley CS, Da Silva N, Georgakis A, et al. (1998). "Mapping of the human CD11c (ITGAX) and CD11d (ITGAD) genes demonstrates that they are arranged in tandem separated by no more than 11.5 kb.". Genomics. 49 (2): 334–6. doi:10.1006/geno.1998.5232. PMID 9598326.